Gold Prices in 2014: After two days of declines, gold prices were up today (Wednesday). Spot gold was last quoted up $12.40, or nearly 1%, at $1,293.20 on bargain hunting and short covering. Precious metal traders, however, remain guarded ahead of Thursday's European Central Bank meeting and Friday's closely watched jobs report. Gold prices slipped Tuesday after encouraging U.S. economic data sent Wall Street stocks higher. Spot gold ended Tuesday's session down $5.40 at $1,280.00 an ounce, a seven-week low. 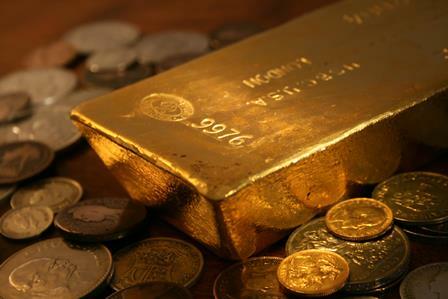 Pressuring gold prices Tuesday was data showing U.S. manufacturing growth picked up last month. Data from the Institute for Supply Management report showed America's manufacturing sector expanded for the tenth straight month in March. The news sent the S&P 500 Index to its seventh record high in 2014. The broad-based index rose 0.7% to 1,885.52, surpassing the March 7 record close of 1,878.04. Monday, the yellow metal gave back $10.40, or 0.8%, to $1,283.40 on dovish comments from U.S. Federal Reserve Chair Janet Yellen. Speaking in defense of the central bank's easy money polices and historic low interest rates, Yellen's words drove investors to stocks and sent markets higher. Yellen reiterated the Fed still has more to do on the job front and said the U.S. economy still requires the central bank's support. Despite Monday's drubbing, gold still managed to turn in a 6.8% gain for Q1 of 2014. That was handily better than the Dow's 0.7% first-quarter decline, the S&P's 1.3% gain, and the Nasdaq's 0.5% rise. As global economies continue to recover, market participants are likely to favor risk-on equities over risk-off gold – near term. But further out, industry experts expect the yellow metal to soar to new record highs. Money Morning's Global Resources Specialist Peter Krauth gave us a more technical analysis earlier this year on why gold is headed higher long term – and is likely to close out the year on a gold gain.